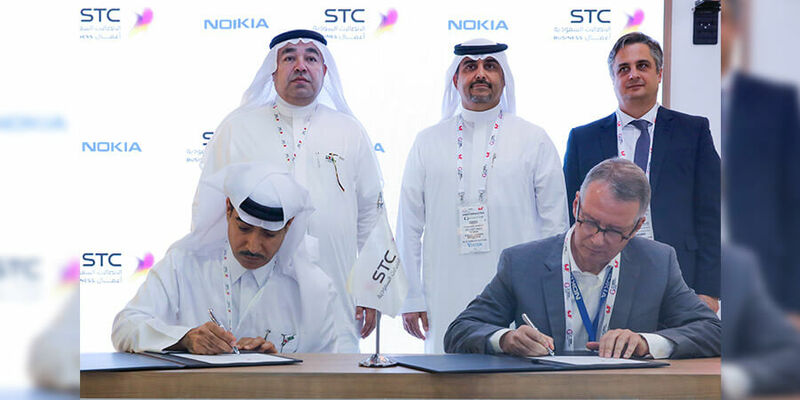 At GITEX Technology Week 2018, Nokia and STC Business signed a memorandum of understanding to collaborate on the launch of the air-to-ground pilot network in Saudi Arabia. The two companies have already conducted a successful trial of Nokia's LTE-based air-to-ground solution in a flight from Riyadh to Jeddah in Saudi Arabia. This trial network is the first of its kind in MEA, after the launch of the hybrid satellite and air-to-ground European Aviation Network in February 2018. At GITEX, Nokia is showcasing how air-to-ground technology can significantly improve airline passengers' experiences. For the trial network, Nokia provided a fully dedicated end-to-end network, including Nokia's LTE air-to-ground radio access network, core infrastructure and applications. Nokia's professional services team deployed specialized air-to-ground sites and carried out extensive testing to ensure a successful trial. Thales, Nokia's technology partner for aviation equipment, provided the onboard equipment for the trial network. Dr. Tarig Enaya, Senior VP of Enterprise Business Unit at STC, said: "We are committed to bringing the best and latest technology to the region and this initiative is a testimony of this. Nokia is the world's only company that has a proven LTE end-to-end solution to provide in-flight broadband, which enables the passengers and the crew to communicate in real-time. We have a longstanding relationship with Nokia, and are delighted to work with them to introduce this LTE-based in-flight technology to significantly improve the experience of the passengers." Mohamed Abdelrehim, head of end-to-end sales solutioning for Nokia MEA, said: "We are proud to collaborate with STC and showcase the potential of air-to-ground technology at GITEX in Dubai. The air-to-ground technology will enable STC to provide new and revolutionary services for their customers and add new revenue streams. With high-speed and low-latency broadband, airline passengers will be able to communicate with their loved ones or for business without any disruption because of air travel. Also, the airline crew will be able to improve operational efficiency because of better real-time communication between the flight crew and ground staff." Pascal Lesaulnier, Chairman and CEO Thales Saudi Arabia, said: "We are proud to collaborate on the trial with our partners Nokia and STC. We believe this trial, which is a first for this technology type in Saudi Arabia and in the region, will pave way for a regional in-flight high-speed broadband connectivity solution benefiting airline passengers and crew in the region." Nokia's LTE air-to-ground solution is currently the only solution specific to the aviation industry and supports real-time and ultra-broadband communications during a flight. Nokia's air-to-ground solution uses specific spectrum to avoid interference with terrestrial networks. The on-board equipment, including the antenna, is especially designed for this solution. It uses special algorithms developed by Nokia Bell Labs to enable ultra large cells for efficient airspace coverage and connectivity to high speed aircraft. The solution offers passengers "home like connectivity" at high speeds with low latency at lowest cost per bit - allowing more travelers to use the services. Further, low on-board equipment weight and size leads to lower fuel consumption and quick on-board installation time which facilitates faster installation.